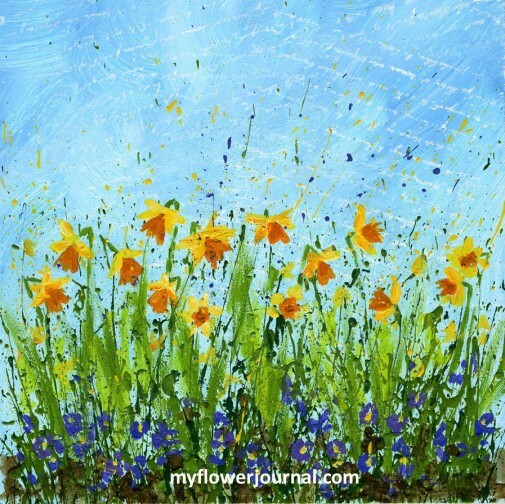 Daffodil Doodles are easy to paint in watercolor or acrylic if you follow these 4 easy steps. You can use your daffodil doodles to make cards, journal page borders or framed splattered paint art. Using watercolor or acrylic paint choose a darker yellow or orange to paint the center of the daffodil. 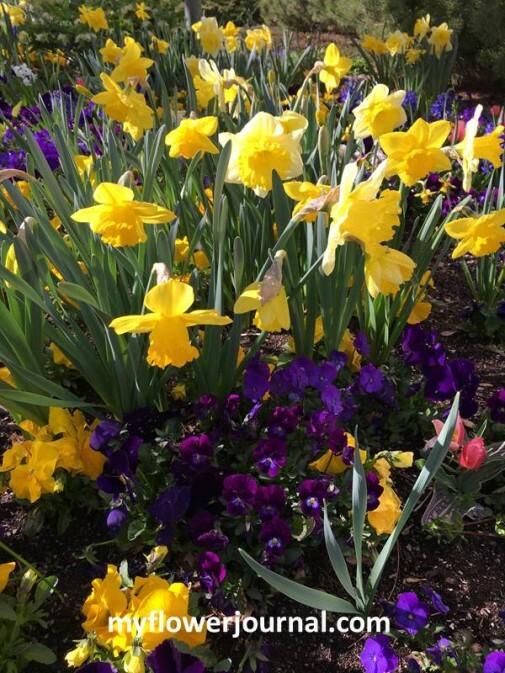 Most daffodils look slightly down or straight out-not up. Refer to my example above to copy the shape. Keep the bottom edge uneven to give it a more natural look. Vary the direction the center part of the flower faces. You can do a few that look like they are facing forward making a circle shape for the center. Add a few lighter yellow petals to the back and sides of the center you painted. Add the stem. If you look at a daffodil example above or my inspiration photo below you can see that the stems come out straight out from the back of the flower then bend and go straight down. Painting the stem this way helps identify it as a daffodil. Last I added some leaves and a few dabs of purple paint to look like pansies, dabs of brown for dirt and a few paint splatters in yellow and purple. I used these 4 steps to create daffodils in watercolor and acrylic paint, but you could do the same thing with brush markers. I did not draw anything with pencil first. I did all of the daffodil doodles with a brush and paint. They were quick and easy to make and would make great cards, gift tags, journal borders or framed art. My husband and I were recently in Salt Lake City and visited the beautiful gardens at Temple Square. There were lots of daffodils blooming surrounded by purple pansies. This is one of the many photos I took that day and the inspiration for my daffodil doodles. 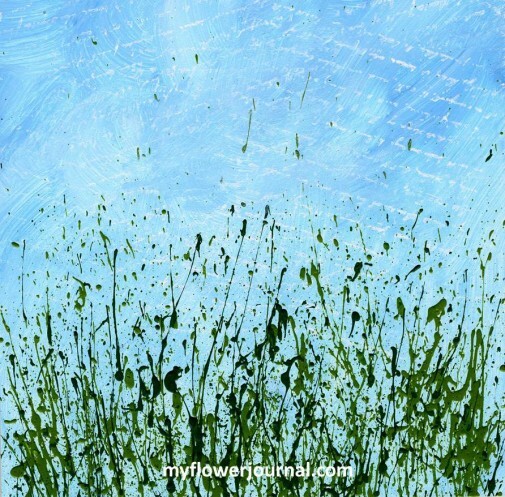 Often when I create my splattered paint flower art I paint random flower shapes in a variety of colors. As I looked at this photo I decided to try a splatter painting with daffodils as the main flower accented with purple pansies. I started with a 6×6 ampersand gesso board and painted the sky then splattered the green and let it dry. You can read more about my process and the paints and brush I use here. After it was dry I painted the daffodils using the 4 steps outlined above. I added stems with the bend characteristic of daffodils. Then I brushed on more leaves and added dabs of purple paint for the pansies and few little yellow centers. I also added a little brown for the dirt. To finish I splattered some yellow then purple paint. If you want to read a charming book about daffodils you can read my review here. oh this flower field is so lovely!! Thank you for sharing another great tutorial Tammy! Fun to have a step by step to the outcome of your lovely art piece. Colorful, splashy, and spring! Thanks for sharing. Lovely daffodils. The are just suitable for April. You have a real talent with this style of painting. Really beautiful. What a great way to paint!! Beautiful daffodils with pretty color and texture!! Thanks for the tutorial, too!! Beautiful! I don’t know if I can get anything close to yours, but your tutorial certainly gives me help and hope. Thanks! This is wonderful! I was just saying I wish I could paint or draw but not a drop of ability in my hands. I use to do ceramics but would hide mine because it was always so awful. But I certainly do appreciate others ability to create! Thanks for sharing!